This exceedingly hip combo from the Twin Cities lays out ten original tunes expertly performed on acoustic guitar, upright bass, harmonica, and percussion. From the cool, swinging riffs of guitarist Bobby E.’s Riptide to Hoover’s slow-burning Tonguin’ Groove, the playing and writing is engaging and refreshing. While each musician contributes many fine moments, the blend they create is most exquisite. This CD is titled “Dream of the Serpent Dog” and it’s absolutely killer! I don’t normally listen to modern jazz, but Clint’s harmonica playing is masterful and he makes it a delight to listen to. Clint never overplays, but is as tasteful as ever and he makes me wish that I had spent more time learning the chromatic harmonica. He plays arpeggios with the limber dexterity of an Art Tatum. His playing on the diatonic is equally tasteful as well and he makes me want to practice harder. Overall, this CD is a definite must-have. Clint Hoover has just released a knockout jazz CD Dream of the Serpent Dog, focusing on blues harp and chromatic. He is so good at each it is virtually impossible to determine which he plays better. The album is so musical that it is only after listening to several tracks that his wonderful technique becomes apparent on both harps. The playing is so fluent that anything seems possible, that there are no bounds that confine the playing of mere mortals. This stuff is great. He has this incredible tone, whether its on chromatic or overblow diatonic and the kind of fluid horn lines that horn players would steal from him. When Clint Hoover plays it conjures up the best of two worlds: Toots on chromatic and Howard on overblow-diatonic. Needless, to say, Clint has been playing for 24 years, so its no surprise he is good. And while this is a jazz album, you don’t really have to speak jazz to understand and enjoy it. Most of them are the kind of catchy tunes that you would expect to hear on the radio. This is an acoustic album, with lots of fingerstyle guitar in it, along with an upright bass and acoutic percussion. This is one of those thoroughly delightful instrumental albums that you can listen to over and over again, each time hearing something that you missed the first time. All of the tunes are originals so those unfamiliar with this quartet might not recognize these tunes, as they were written by the group members. The 61-minute CD has 10 tunes. While the tunes are original, many of the phrasings and passing runs sound familiar so listening to the CD sounds familiar, even when the tunes are not. But since the runs don’t go where they are “supposed” to go, the music is interesting and exciting, never boring. The first tune is Riptide (CBH 2016 chromatic. Song key: Gmi/F) which alternates licks with the harp and the standup bass and bongos for a light, happy tune that you could whistle. Almost evocative of Blusette by Toots in that respect. 717 (Super 64X. Song key: F) is a lilting fingerstyle guitar tune with the counterpoint of the harp. Ripley’s Waltz (Dream of the Serpent Dog) opens with an Eastern snake charmer theme (CBH 2016. Song key: A). Then it switches to an accordion sound and then bouncing single-note Sunday-in-the-park type of theme. Then it returns whence it came, via a bass solo. Easy Dreams (Super 64X. Song key: E flat) evokes a “Fly Me to the Moon” kind of feel. Tonguin’ Groove (Super 64X. Song key: Gmi. ), is a light swing, swinging down memory lane somewhere. The Schlepp: (CBH. Song key: C), tends toward a bass solo, which is not unusual, considering it was written by the bassist. Waltz for Warner: (Super 64X. Song key: G) is another variation on the jazz waltz, which could be an oxymoron, but actually sounds quite charming. Snake Oil (A Golden Melody, 2nd flat position (aka B). Song key: G flat. has a slow, horn-like feel, right out of early jazz, complete with wah-wah effects, in an after-hours setting with lots of overblows and such. Snake Charmer (Super 64X. Song key:Cmi.) is a song apparently more related to the human snake than the reptile. When Harry Met Sal: (Super 64X. Song key: D/E.) opens with a few bass runs, before introducing the bittersweet harp line. This multi-fronted group plays a brand of Jazz that includes sad melodies and happy-time music wrapped in blues-infested tunes and lyrical ballads, all dominated by the harmonica sounds of Hoover. His dominance notwithstanding, they bill themselves under the three names. Percusionist Santiago appears on all cuts but does not get billing status. Hoover’s harmonica has a lovely tone to it, whether he is using the chromatic or diatonic version. His playing has a definite sound relationship to the accordion and even though it is the principal voice, it does not overwhelm you. Each of the album’s tunes was penned by one of the three billed leaders with the exception of the bluesy Snake Oil which was co-composed by Hoover and Bobby E. Hoover wrote the title piece. It is an exploratory melody with Eastern European underpinnings allowing plenty of space for individuality. Hoover seems to be most at home playing heart-rending ballads. His instrument lends itself to this melancholic mode, and he creates a plaintive atmosphere on songs of that type. Booby E. sticks with the acoustic guitar throughout the set. He is an extremely melodic player as a soloist and an apt rhythm maker behind Hoover. His solo on Snake Charmer is particularly well done. An egalitarian effort is shown on The Schlepp. Although not a long song, each of the four artists solo in sequence after the basic theme. Even Santiago gets a turn. Chenoweth opens the final cut with a short mood-setting solo, but his principal role is in the support mode. This group is surprisingly delightful to hear and certainly has written some unique songs. Although the recording claims joint leadership, you will come away with the realization that Hoover and his harmonica are really the mainstay of this group. Sure fingered guitar meets cool, jazzy chromatic and diatonic harmonica, meets solid and inventive upright bass and percussion — all good. The compositions are beautiful (none more so than 717), the solos are interesting (especially those of Clint Hoover’s harmonica) and the arrangements and recording are just right, not too much, not too little. The first collaborative effort by Clint Hoover on harmonica, Bobby E. on acoustic guitar, Jim Chenoweth on upright bass and Mac Santiago on percussion, Dream of the Serpent Dog consists of 10 original acoustic jazz compositions that feature the chromatic harmonica as the principal lead voice. With the harmonica taking center stage in this instrumental album, the guitar, drums and bass offer a rich texture for this eclectic album. Hoover’s composition, Ripley’s Waltz or Dream of the Serpent Dogs, is perhaps the most in-depth piece on the album. For lovers of complex and intricate blends of music, it is a masterful piece. Hoover’s Snake Oil has a delightful blues feel to it. And all of the cuts show an exuberance and sense of play comparable to other jazz greats such as Toots Thielemans and Hendrik Meurkens. In additional to great regional reviews, Dream of the Serpent Dog has received a rave review in Cadence, a national jazz magazine. A professional for 17 years, Hoover has provided music for movies, commercials, TV news themes, radio and theater. He has performed on recordings by Bill Hinkley and Judy Larson, Peter Mayer, Benny Weinbeck and others. He has opened shows for artists ranging from the Dirty Dozen Brass Band to Sugar Blue, and has earned a reputation for his skills and talent. However, Dream of the Serpent Dog is the first full exposition of Hoover’s vision. It will not be a disappointment to those who love wonderful jazz. Guitarist Bobby E., harmonica player Clint Hoover, percussionist Mac Santiago, and bassist Jim Chenoweth have put together a fine album of acoustic roots jazz. All of the ten songs are original compositions, and feature relaxed, melodic chromatic harmonica playing by a true master of the instrument. Right off the bat the quartet swings in with “Riptide,” a song that almost takes you over the edge, but keeps you planted in the groove. 717, a beautiful ballad written by Bobby E., is a great vehicle for Hoover’s magical chromatic abilities. He demonstrates a relaxed, mature sound, and works his solo into a mixture of passion and restraint. His vibrato is full, and carries the weight of the light accompaniment. Ripley’s Waltz (Dream of the Serpent Dog), gives us a glimpse at the many levels of talent Hoover has achieved on his axe. The opus starts out with an Arabic introduction, leading us into a melodic passage that leaves Hoover room to stretch out. Bassist Chenoweth then takes the spotlight and gives us a taste, before leading the trio back into the head. A refreshing aspect of this album, besides all of the material being original, is Hoover’s stylistic approach toward the harmonica. Hoover stands on his own as an amazing musician with a unique and individual voice. Jazz guitarists owe a nod to Charlie Christian, but they all do not have to be compared to him. The same is true for chromatic harmonica players in relation to the remarkable Toots Thielemans. Hoover stands on his own as a fine player, compared to any musician, regardless of the instrument. It is also refreshing to see the harmonica used in an ensemble, without the “front man” disposition. Howard Levy in the Newgrass ensemble Bela Fleck and the Fleckstones, Jim Fitting from Boston blues rockers Treat Her Right, Mickey Raphael in Willie Nelson’s band, and all of the great players to come up through Muddy Waters bands. These are prime examples of the harmonica being used as another instrument in a group setting. On Dream of the Serpent Dog, Hoover takes the majority of the solos, but this is a group effort. Hoover’s diatonic playing is also another reason to consider him a master of the mouth harp. The song Snake Oil, starts with a deep melodic introduction by Hoover on the diatonic. His tone is pure and acoustic, with a tasteful demonstration of hand and throat vibrato. It also sounds as if Hoover sneaks in some overblows/draws into the mix, to give him that extra melodic dimension. Overall, this is a very atmospheric, vibrant album that lets harmonica player Clint Hoover shine bright, along with a creative percussionist, swinging bassist and an accomplished guitarist that lays down apt rhythms and tastefully melodic solos. Dream of the Serpent Dog, is a very refreshing chapter in modern jazz. Just as Sandy Weltman deserves credit for being a truly original, innovative player, Hoover deserves equal praise as a deserving star in the jazz world. Dream of the Serpent Dog is a delightful excursion through territory that seems fresh yet comfortably familiar at the same time. Employing chromatic and diatonic harmonicas, acoustic guitar, upright bass, and percussion, Clint Hoover, Bobby E., Jim Chenoweth, and Mac Santiago share some very tasteful original melodies. The songs themselves are presented simply and conjure up lots of imagery. This is a jazz album recorded so as to make the listener feel he or she is right there with the musicians, perhaps in some sidewalk cafe. The musician’s approach is sometimes earnest, sometimes whimsical, and always spot on. Witness the song Tonguin’ Groove which could be aptly subtitled: The Pink Panther Meets the Peanuts Gang. It’s sly, witty, and Clint employs a pleasing handful of musical confetti with flawless precision at the end of the song that adds a nice flavor. The title song, Dream of the Serpent Dog begins shrouded in a mystical Middle Eastern feel which then modulates into a lighthearted skip. Picture if you will that you are a dog twitching in a somber dream that suddenly opens up into a sunny morning meadow custom made for a dog to romp through. Clint’s harmonica takes us on a musical exploration akin to a dog sniffing and rooting around through everything in it’s path. Compositions by Jim Chenoweth are the stuff of Sunday afternoon rowboat rides on a calm, lazy lake. Both his Easy Dreams and Waltz For Warner literally drift along and Clint’s harmonica floats amongst with an easy, nearly effortless dexterity. Each number on this record conjures up very distinct imagery. The music is deceptively simply arranged and flawlessly executed. The interplay between these fine musicians is a treat. You may accuse me of having an overactive imagination but before you do, put the record on, sit back, close your eyes and see if it doesn’t just take you away to some really enjoyable places. This CD contains ten very interesting Jazz/Blues/Ballads. All are original compositions, carefully constructed and full of free improvisation. I think that Clint plays the CX12. This seems to be the current trend on chromatic harmonica. Thierry Crommen and Brendan Power, amongst others, prefer the CX12 for jazz and modern music. The songs always start quite structured, as solid pieces. Then in middle of the piece the soloist, usually Clint, takes a detour and starts improvising to the max. These boys really have a lot of imagination. Clint has a very clean tone, whether on chromatic or diatonic. His harps sound clear and full. Overall these recordings have an altogether authentic quality. A pleasure to my ears! Clint plays the harp the way Picasso paints, in a very structured manner, becoming very abstract at will. Only a few accomplish this. A musician must really know the fundamentals in order to be able to turn everything upside down without losing the structure. This is exactly where Clint’s talent for improvisation is. He totally takes apart the foundation only to put it back together in a more interesting and new way. Cut number 3, Ripley’s Waltz, demonstrates all of this, and when you hear cuts 8 and 9, nothing is missing. These blues, jazz, and ballad compositions are totally hip. I am excited to see what the group will record next! Brilliant compositions by Clint, Bobby, and Jim!!! Great Playing! Track 2 (717) has to be my favourite. The acoustic guitar introduces it, with such a lazy afternoon, smooth and comfortable feel – that’s the word! This CD is in the comfort zone! You could play it to your mother. Harmonica techniques like the throat vibrato are not overdone; just brushed in lightly so they truly ornament the music. Here is a real master of both both harmonicas. The music swings along and gets me tapping my foot and nodding along with it. A couple of the later tracks get into what I call “Nodding Donkey Jazz”. Yeah! If you like the intense blues message, or if you like jazz improvisation that defies recognition of a tune, forget it. But if you like to be entertained by music that tells a story, this is for you. The acoustic guitar is the stuff of dreams and the harmonica is expressive and precise, but not to a fault, and while some of the riffs lie on the instrument like an echo of ‘Toots’, it is no clone! In later pieces where he has a solo, even the drummer sounds great, and I speak as one who HATES most drummers! Track 3 is Ripley’s Waltz – is the dream. After a shimmering, dreamy intro where the beat is not obvious, the waltz gets stuck into the nodding donkey. Track 5 Tonguin’ Groove reminds you of the Pink Panther. The Schlep, track 6 includes a thoughtful drum solo; not the usual beat ‘em to death job! Track 7 is the slow Waltz For Warner. Now was that a 2 bar quote from Bluesette? When Harry Met Sal as the final track is a nice tune. I really enjoyed reviewing this. Only space, the final frontier, prevents me from waxing lyrical. It is a rare pleasure to listen to an album that exudes a genuine atmosphere, a link beyond the music itself that carries you through the tracks to what the music means rather than how it’s played. This album by Clint Hoover is amongst those. Not a virtuoso opus, not a harmonica lesson, just a delight to the ear. Jazz often suffers from being difficult to listen to, but it isn’t the case of this jazz. Jim Chenoweth’s double bass, Bobby E.’s guitar and Clint Hoover’s chromatic blend into an atmosphere: the cover art and the titles suggest that it could evoke Meso-American deities lost in a contemporary world. Enough of big words: what do you find in this album? Well first of all, catchy melodies, be it ballads (the bewitching Easy Dreams) or more up-tempo pieces (like The Schlepp where hard driving solos lead to the theme played as a canon by the whole band!) Some tracks remind me of World Jazz, like Ripley’s Waltz that begins with a long Arabic solo by Clint Hoover, delicately supported by arco bass. One of the overlooked gems of local recording in 1997, Dream of the Serpent Dog is exotic, swinging, warm and resonant. The CD suggests Parisian bistros, treks across North Africa, a Mediterranean cruise or a nap on a beach in Brazil — anything but the lake cabins and hot dishes here in Minnesota. 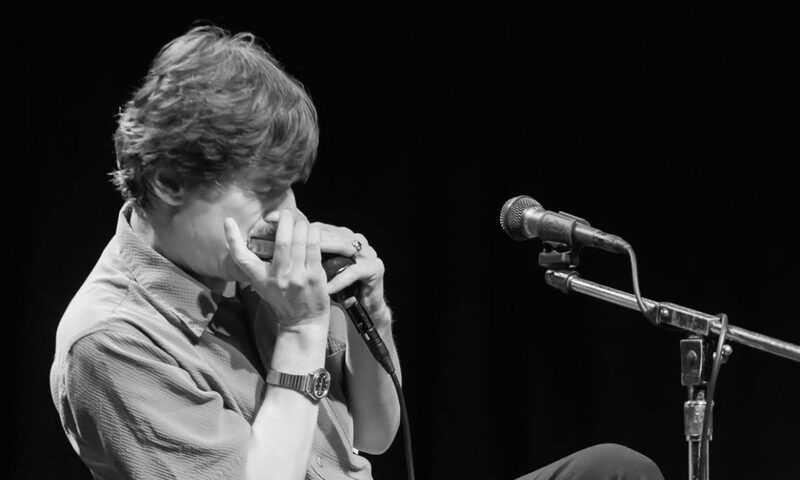 Hoover plays masterful chromatic harmonica, in the tradition of Toots Thielemans. Chenoweth adds full-bodied jazz bass. Bobby E. serves up his own idiosyncratic mix of folk, blues, bristling swing and chamber poetics on guitar. All three write beautiful, engaging themes. And Max Santiago tosses in creative and complementary beats, deftly using congas, bongos, triangle, trap set, a percussion tree and the edge of his cymbals. What a delightfully different group making delightfully different music. On a program of all-original compositions, the guys deliver a very entertaining album. There are some lovely, swinging and infectious swing and blues tunes, as well as some really pretty and infectious numbers, with clever titles. There’s a terrific sense of fun here in the music-making of steel-string and classical acoustic guitarist Bobby E., chromatic and diatonic harmonica player Clint Hoover, bassist Jim Chenoweth and, on some tunes, percussionist Mac Santiago. Each is a fine player, but Hoover stands out, ranking right up there in the small fraternity of harmonica players (Jean “Toots” Thielemans, Hendrik Meurkens, Howard Levy). He’s especially impressive on his own Tonguin’ Groove. All the tunes except one (Snake Oil), are played by Clint on the 64 chromatic and “Snake Oil” shows that Hoover has not ignored the innovations of the Howard Levy school of diatonic jazz playing. This unique CD takes you on a genre bending, eclectic journey of acoustic jazz styles and displays Clint Hoover’s playing (especially on the chromatic) and writing skills at his very best.